Should I get a body scan? How aggressively should I lower my blood sugar level as I have type 2 diabetes? I have no symptoms, should I get a routine mammogram? I feel great, should I follow my doctor’s advice and have my annual physical? These and hundreds of other questions often imply that the more medical care the better and healthier you will be. We assume that more care, more testing, the newer the drug, the more screening, etc. will prevent illness and promote health. In numerous cases this is not true! Although medical care can be superb for the treatment of acutely ill and injured, excessive use sometimes leads to harm. 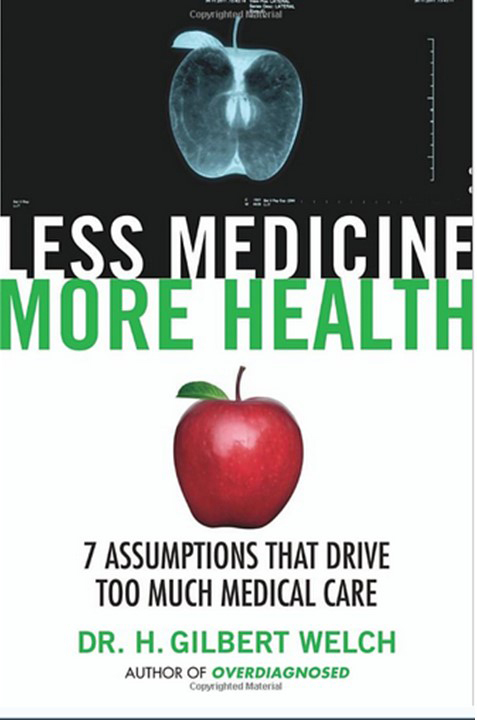 In a superb book, Less Medicine, More Health, by Dr. H. Gilbert Welch, professor at Dartmouth Medical School and recognized expert on the effects of medical testing, the following seven basic assumptions underlying too much medical care are described in a readable and personable style. Welch’s book explains the assumptions and the limitations of the assumption. Before assuming that the recommended medical procedures will improve your health—in some cases it will make you sicker—read his book, Less Medicine More Health. This looks like a must read. Thanks for letting the world know. I will add it to my book list.